Last night we went to the awards ceremony and it rained. Actually, it POURED. 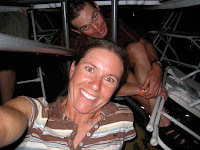 This is fast Brian and I under the table trying not to get soaked. Actually, we didn't care so much about ourselves, we were trying to save our cameras, phones and award certificates. It worked well until the downpour turned into flooding and the water started seeping in under the table. We then left the comfort of "under the table" and headed for better shelter. 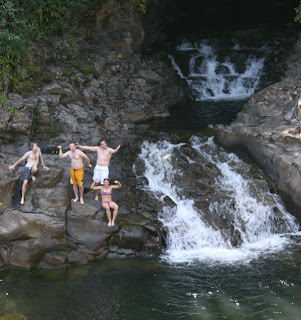 Today was "explore the big island" day. 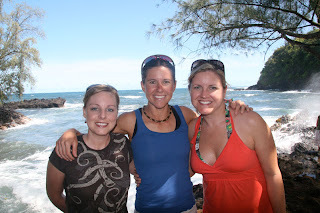 Wendy and LeighAnn planned the adventure and I just went along for the ride - awesome! We made it around the entire island and stopped at a million awesome beaches, swimming holes, etc. 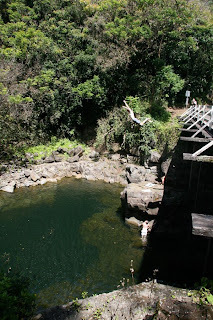 This is Steven jumping off a bridge - I took the "my back is sunburned, I don't want to smack it on the water" approach to getting out of this one. I did however smack my back on the water several times off the tree swing that we found. Thankfully it wasn't too high off the water. 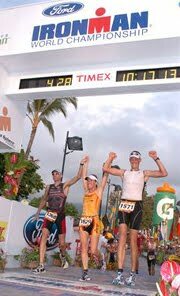 It was awesome to not have any "Be careful, you don't want to get injured before Kona IM." Hawaii has got to be one of the most beautiful places on earth - I took a million pictures today and these only show a small bit of the beauty of the island. 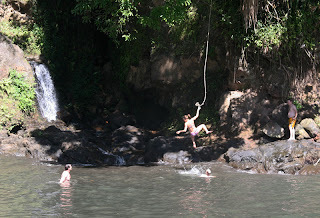 So other than jumping off high structures and rope swings, swimming when we felt like it, checking out a volcano and taking a ton of beautiful pictures, we also ate every few hours. It was pretty much a perfect day in paradise!